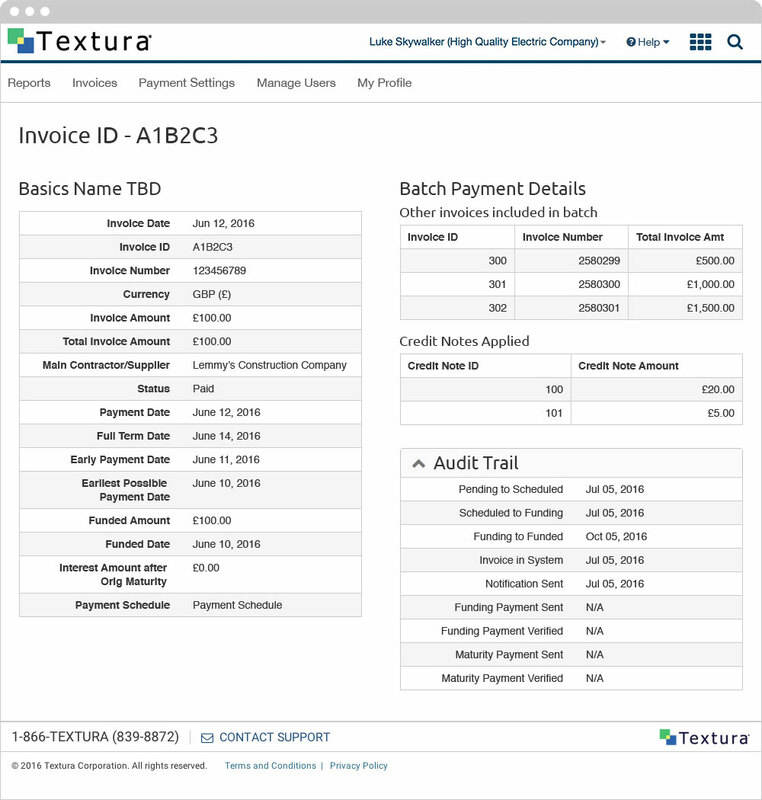 IMS (Invoice Management System) & EPP (Early Payment Processing) was a project that a UK based general contractor asked Textura to build as an add-on to their CPM subscription. 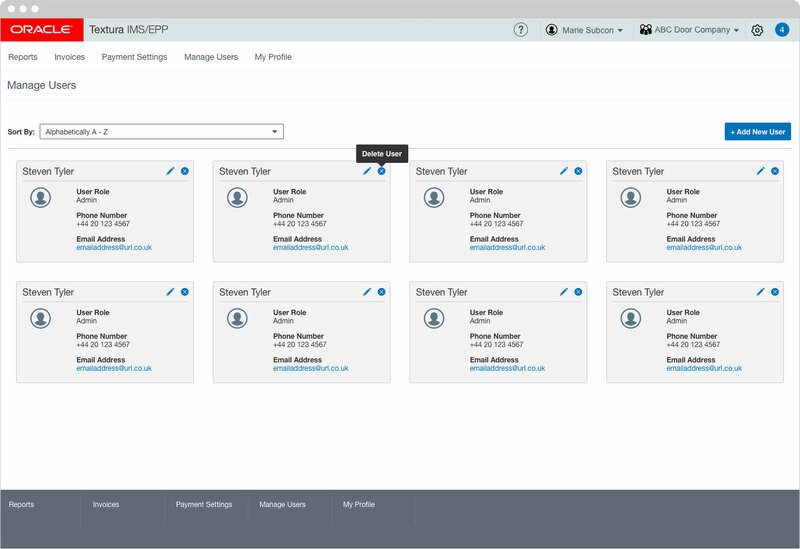 CPM is a payment processing application. This project piggybacked off CPM’s existing back-end, which meant there were several technical limitations that I had to design around. In the construction industry a general contractor will hire out sub contractors for various projects. However, the invoicing/billing cycles of general contractors can take several months before a sub contractor can be paid. 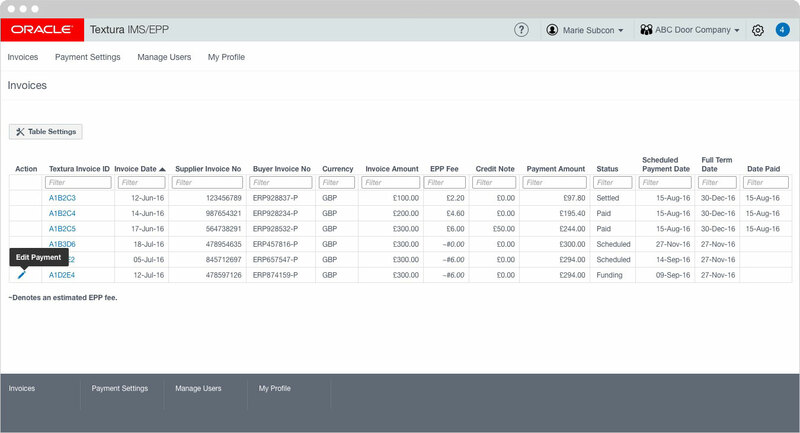 This UK client wanted to create an early payment process allowing sub contractors to be paid early. 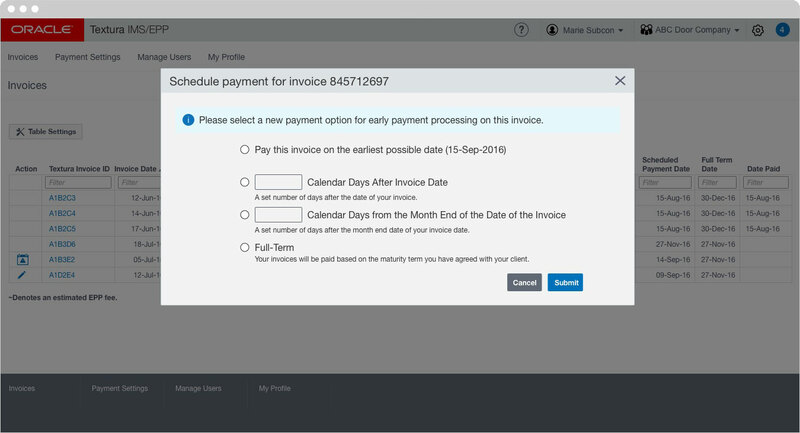 For example if a sub contractor submits an invoice for $10,000 they will have the option of being paid earlier for a small fee. They may choose to be paid immediately, however they would only receive $9,500. 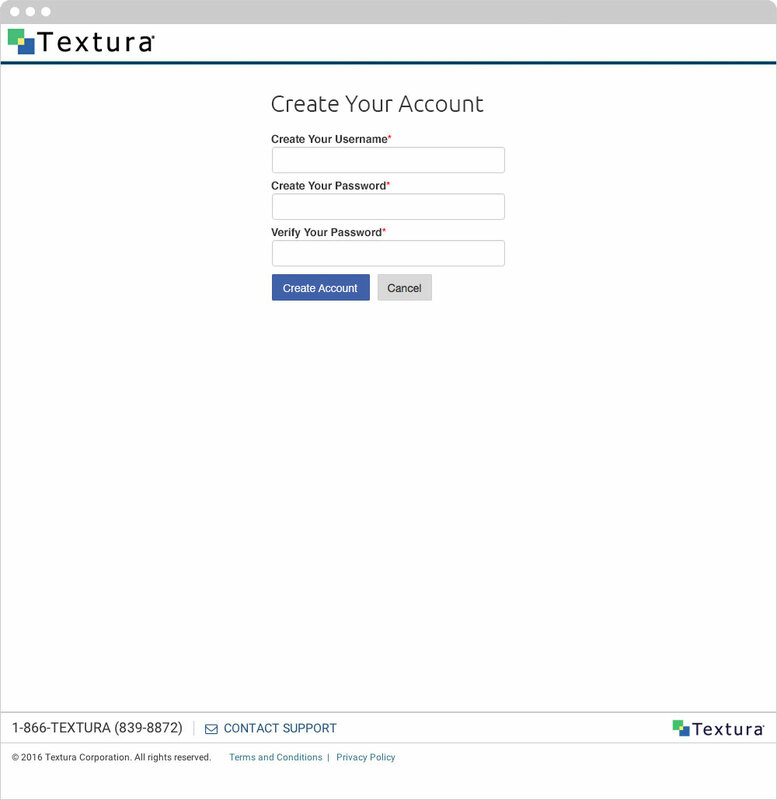 The system was setup in a way where Textura would make money every time a sub contractor chose to be paid early. I tried to call out the earliest payment option when the sub contractor set up their account. Due to UK compliance requirements I could only make that option the first choice. 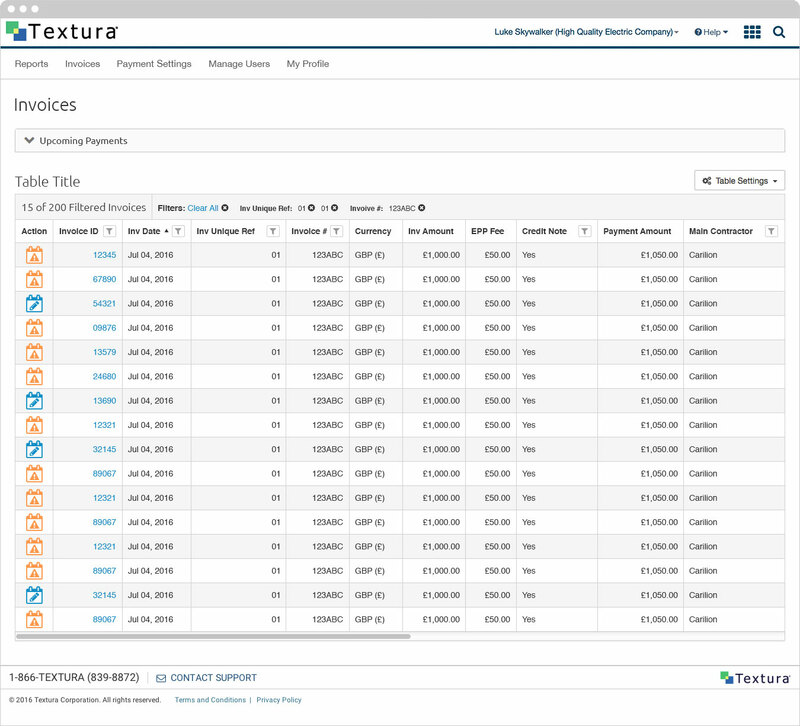 Upon completion of the IMS/EPP Oracle bought and took over Textura. 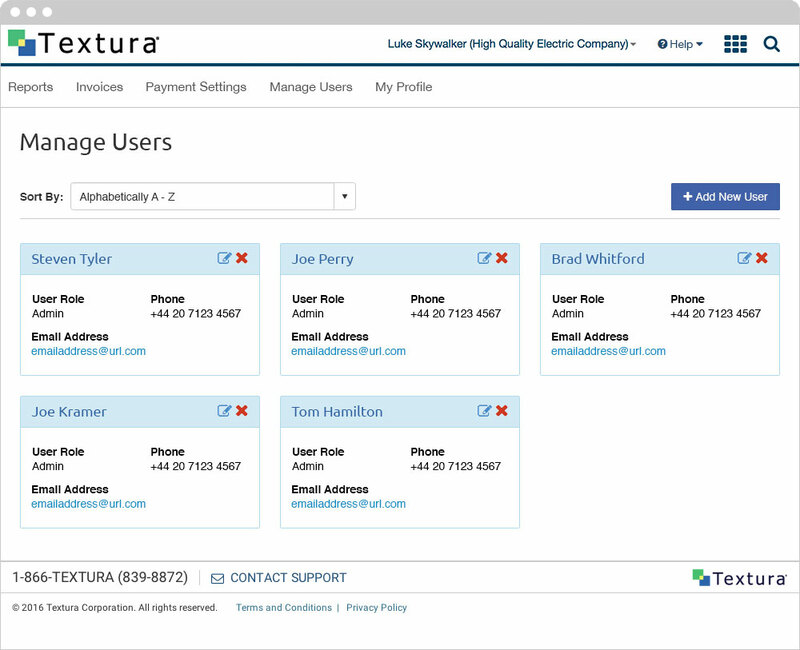 When the takeover was completed I was tasked with redesigning the Textura look to convert to the Oracle Prime style guide. The majority of the functionality stayed in place with one exception. 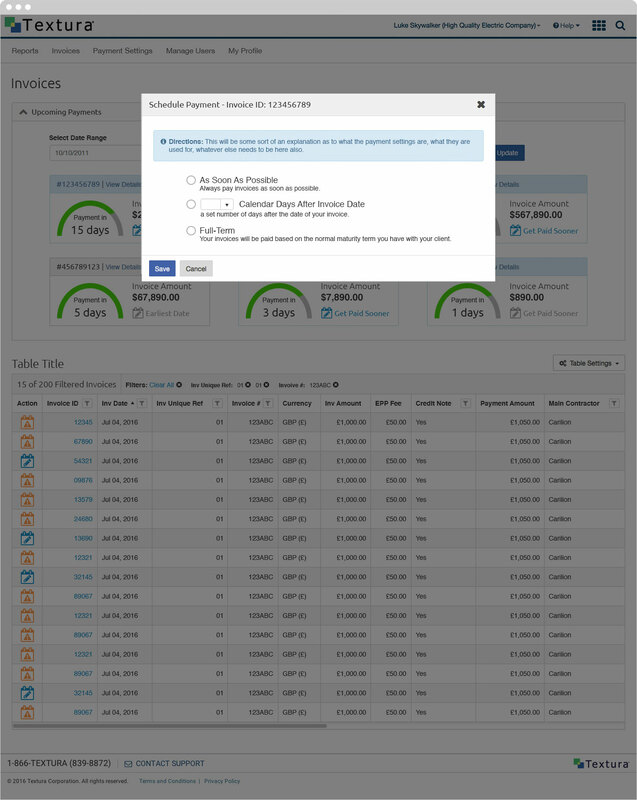 In the table view, I was required to remove the view which promoted early payment. You can see both versions, I have the Oracle one first, which is live and functioning and the Textura version second. 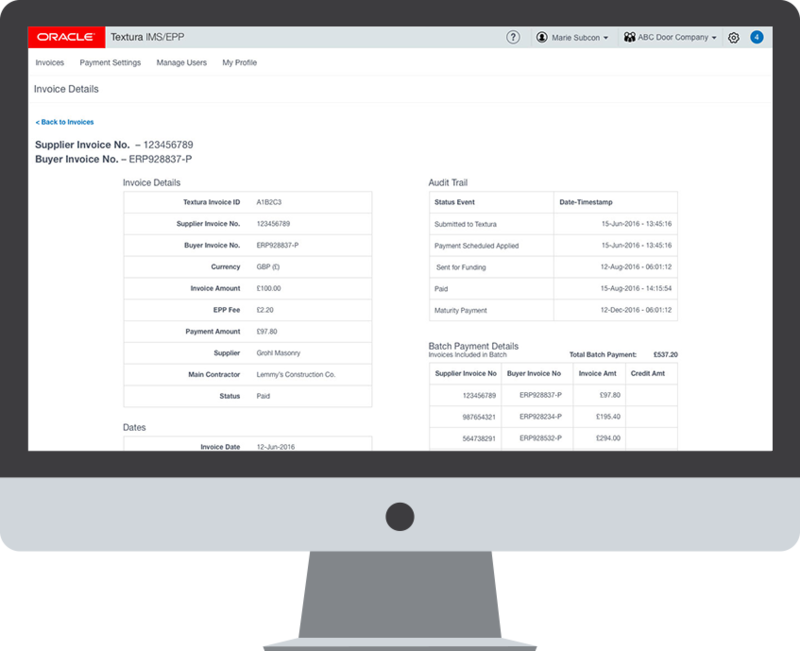 In order for this application to be successful the general contractor mandated that all sub contractors receive a free CPM account so they could manage their invoices. 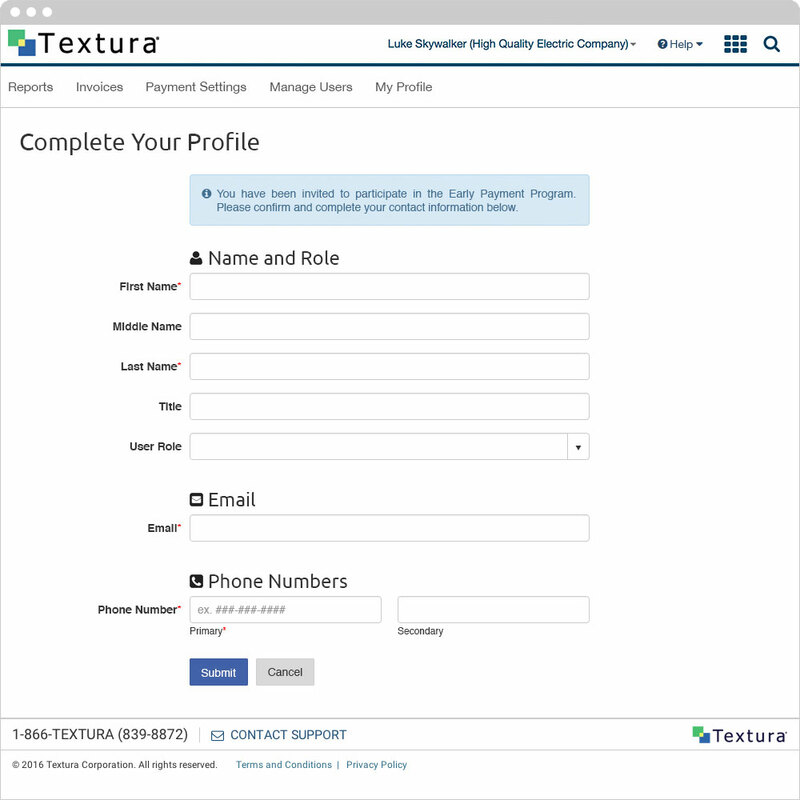 The GC gave Textura a list of all their sub contractors, which was uploaded and created accounts containing a contact person and existing bank information. The system would send automated emails to the subs contractors to finish their account set up. After the user clicks the link in their email they are taken to this page where they create their account by choosing their username and password. 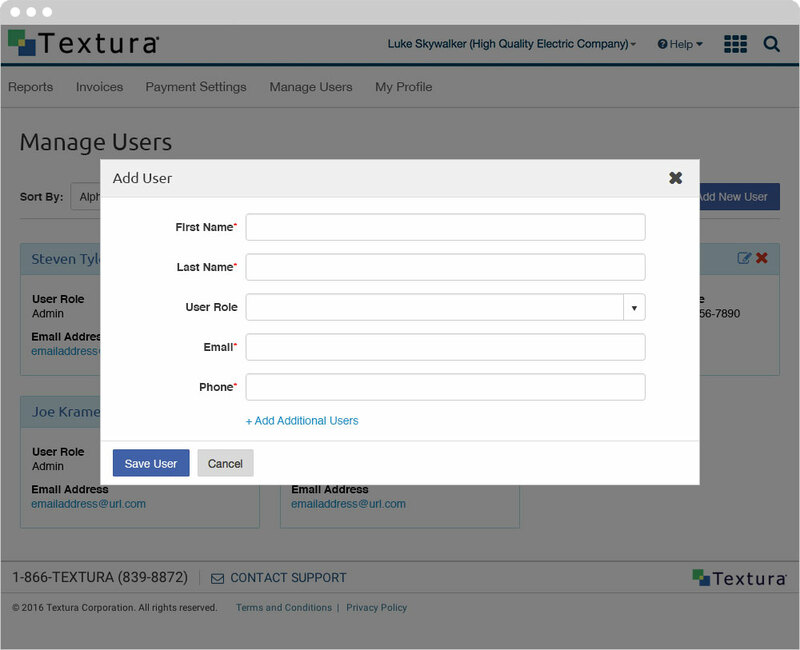 Once the user has set up their account they must then complete their profile. You may notice there is no navigation set up, this was intentional as the idea was to create a roadblock to force the user into completing the set up. 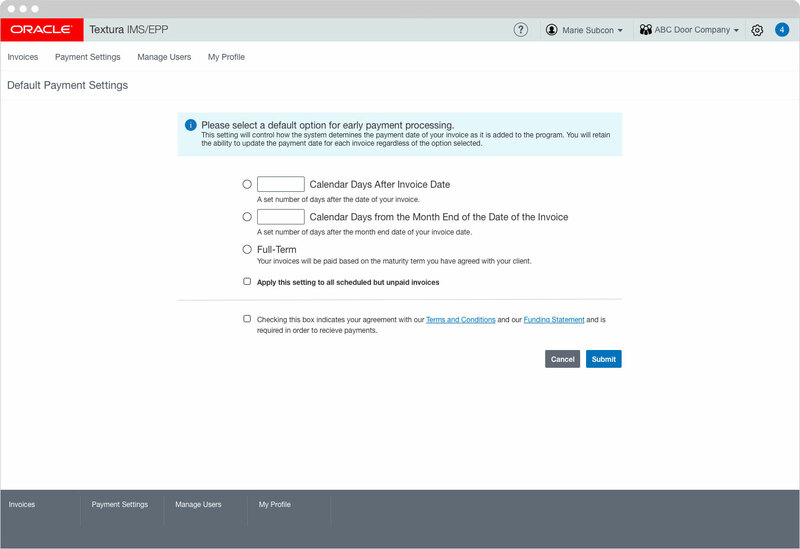 The payment set up page allows the user to select how early they wish to be paid. 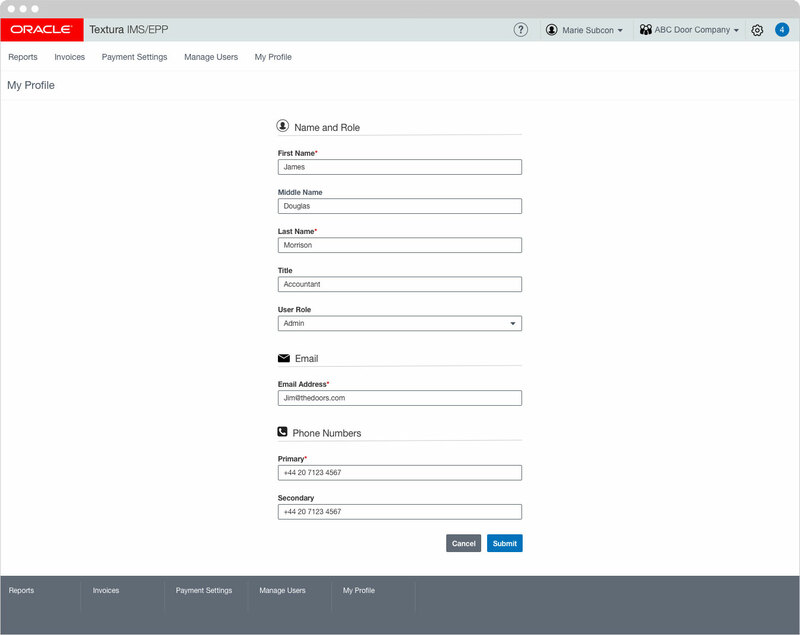 If the user selects the "Apply this setting..." they will never have to enter or edit payment settings again unless something changes as all payments will follow the default setting. 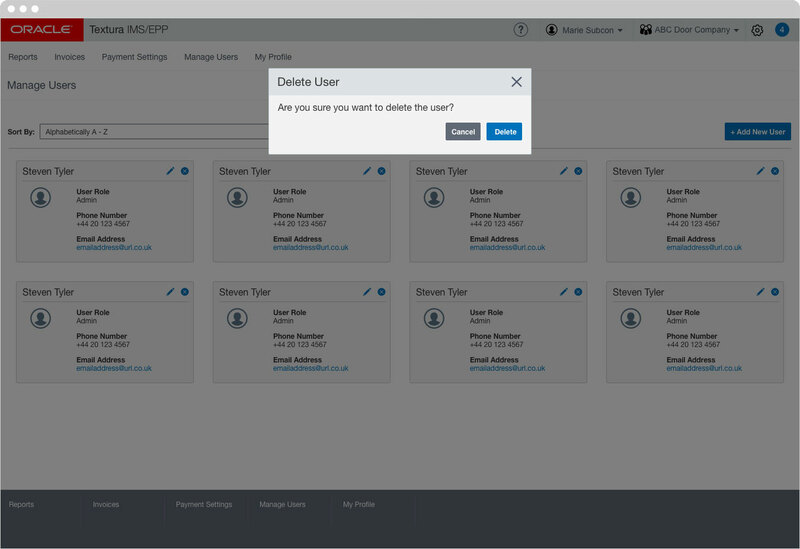 If a user is an admin on the system they have the ability to add, edit or delete users. 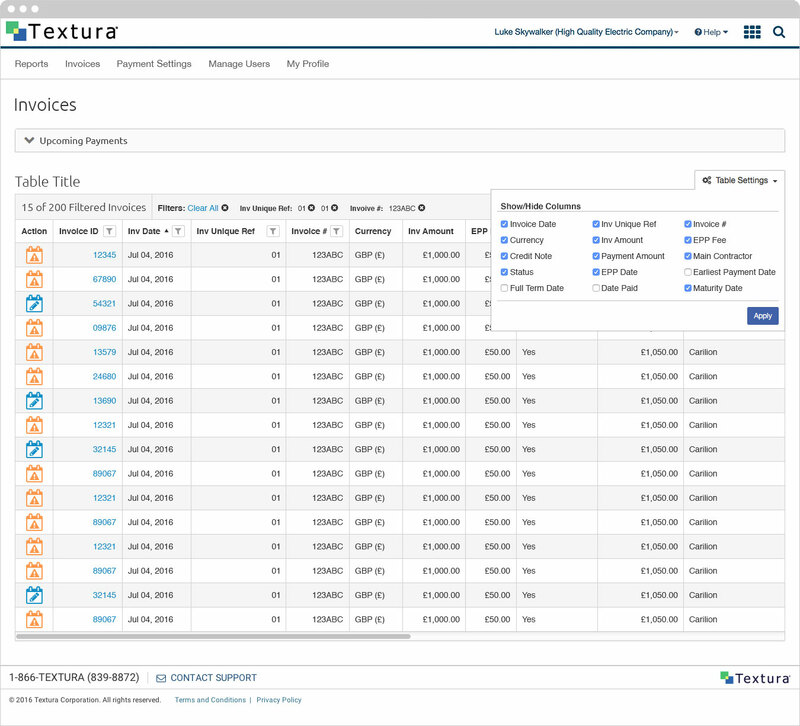 The table displays all upcoming and paid invoices the user may have out. The user can sort by clicking the column title they wish to view differently. The user can filter by typing within the filed above each column. 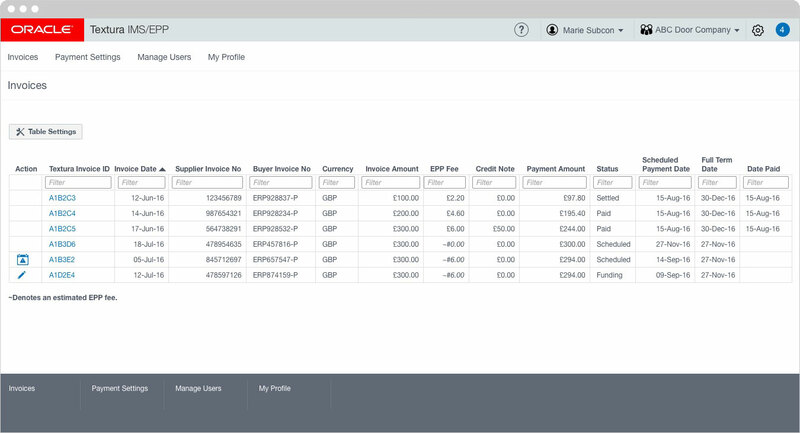 They can also edit or schedule an invoice payment by clicking the pencil and calendar icons. 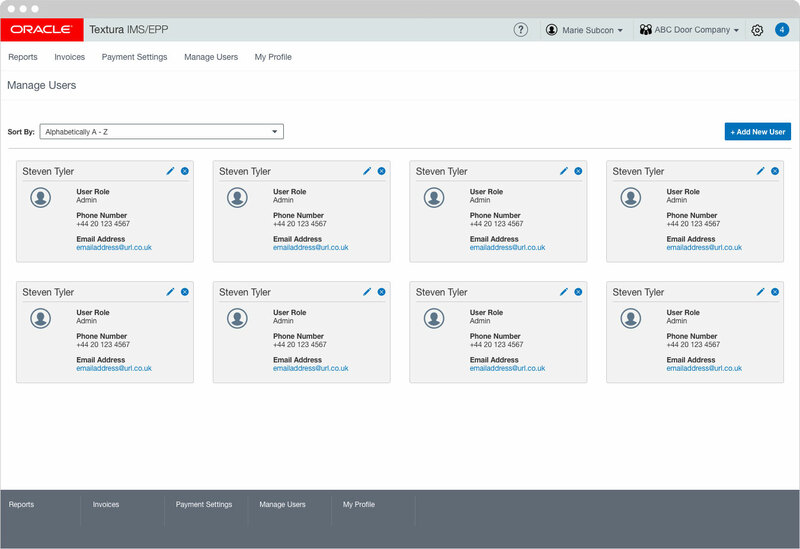 On the Oracle version the table settings are opened as a page overall and the user can drag and drop whichever columns they wish to display or hide. 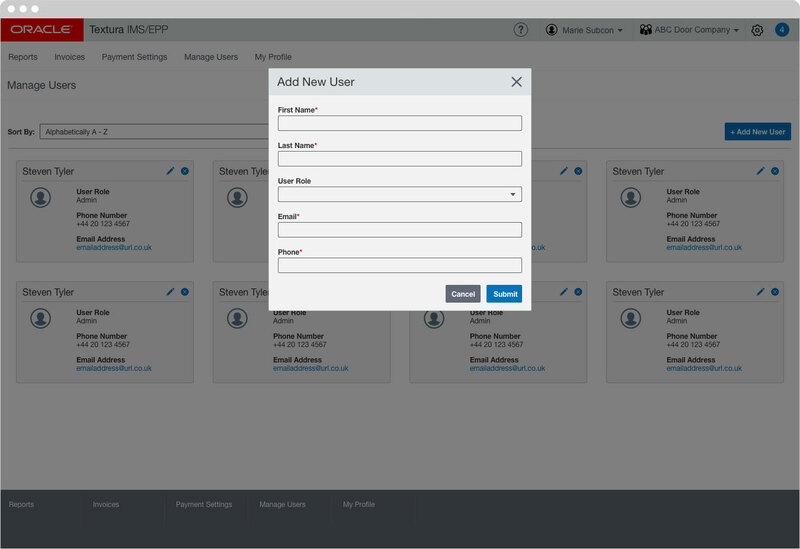 The user can also drag and drop the order they prefer. 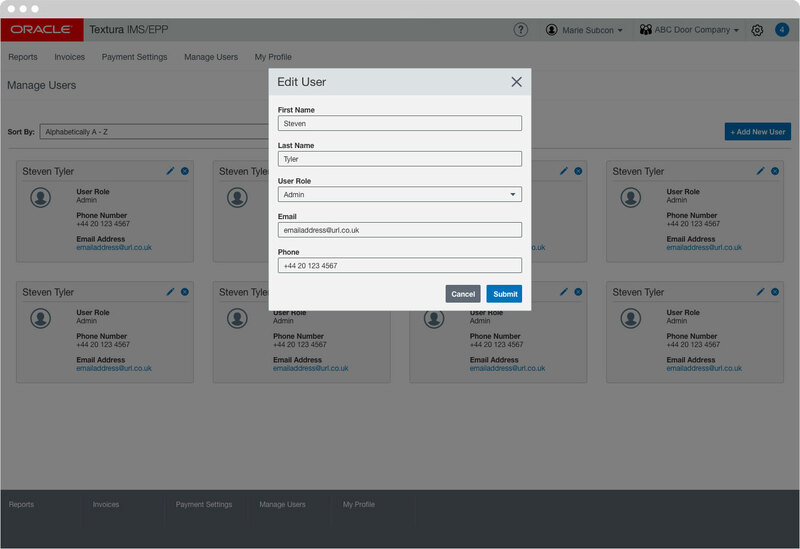 If the user did "Apply all" during the account set up phase, or if the user wants to edit/schedule a payment this is the overlay they would see. The user can only select "Apply all" to payments in the Payment Settings page. This was a technical requirement. When the user clicked the link in their email they would see the below page. 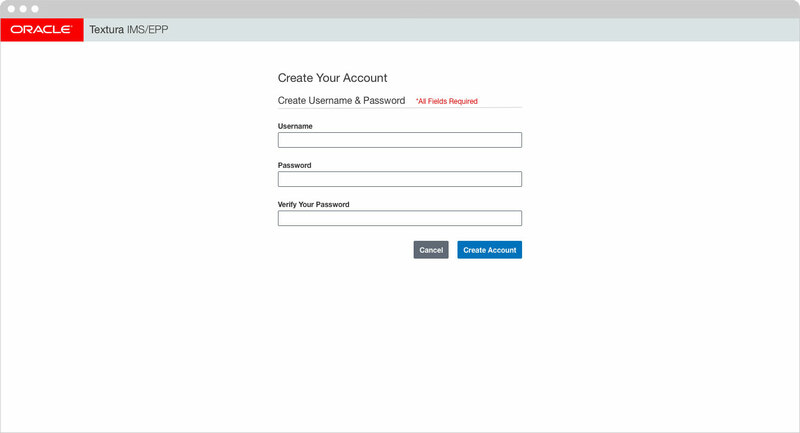 The user would be required to create a unique username and a secure password. Basic user information is required for each profile. 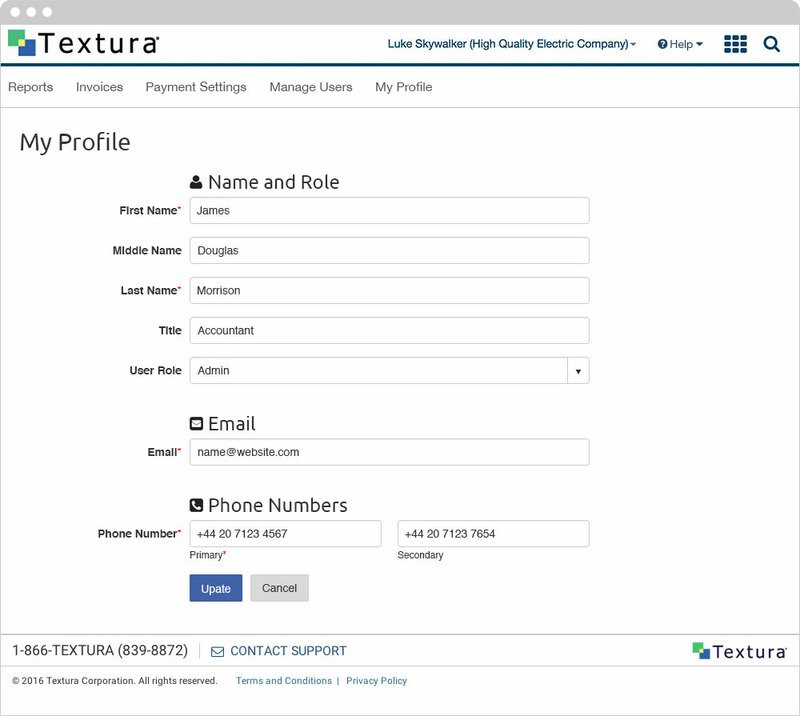 Once the profile has been completed the user is automatically taken the Payment Settings page. This is where the user can choose how they want to be paid. Each option has a quick explanation below the choice. 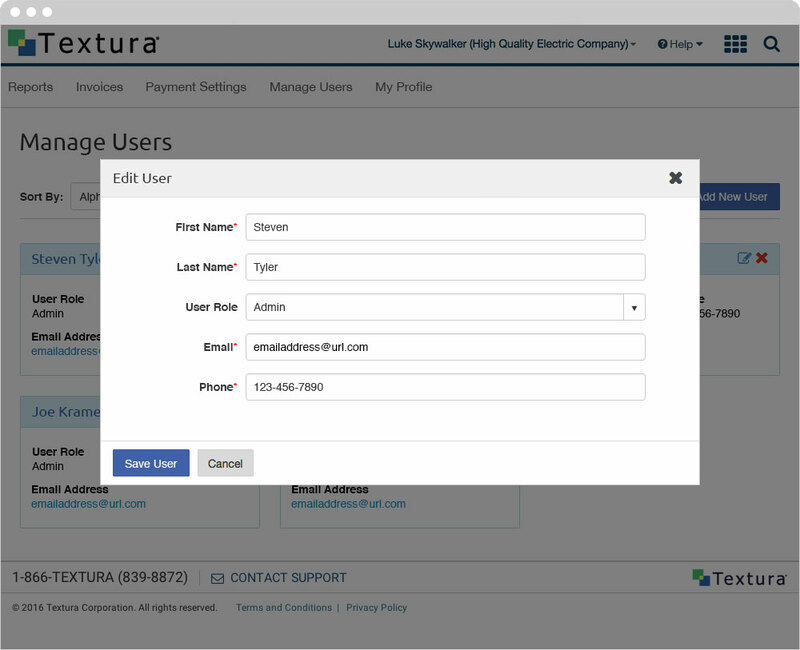 If the primary user wishes to add additional users who can view and edit invoices they can add as many as they want. 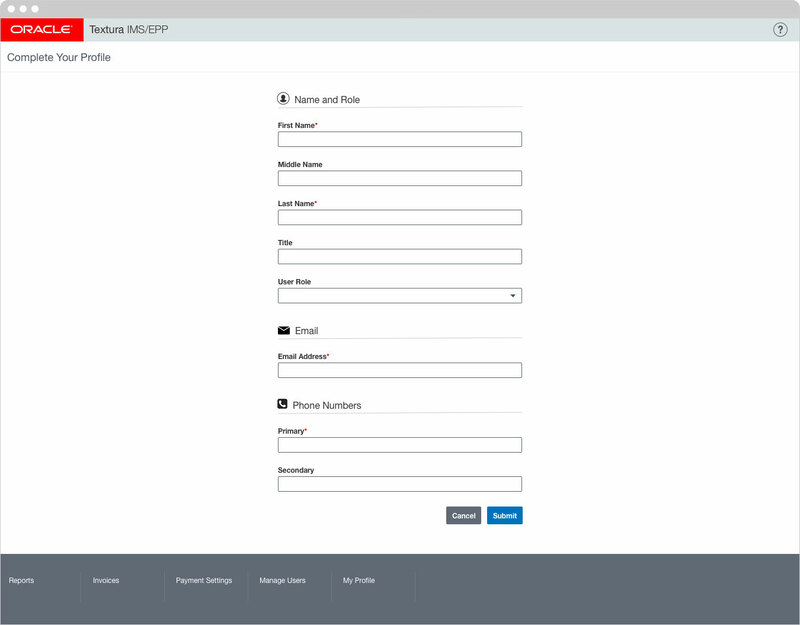 If they click the “+Add Additional Users” text link it will generate another set of forms for them to fill out. Due to technical limitations we were not able to allow the user to upload an Excel file with their additional users. When we were discussing this page the account executive liked the idea of using tiles or cards for the users. According to our records 99% of the sub contractors had 5 or less additional users. An admin can add new users, delete or edit users from this page. 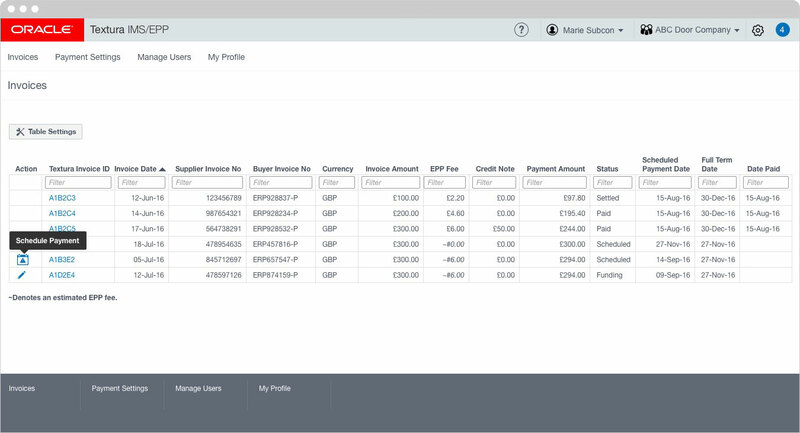 One of the features of the table is to allow the users to decide which columns they want to display. 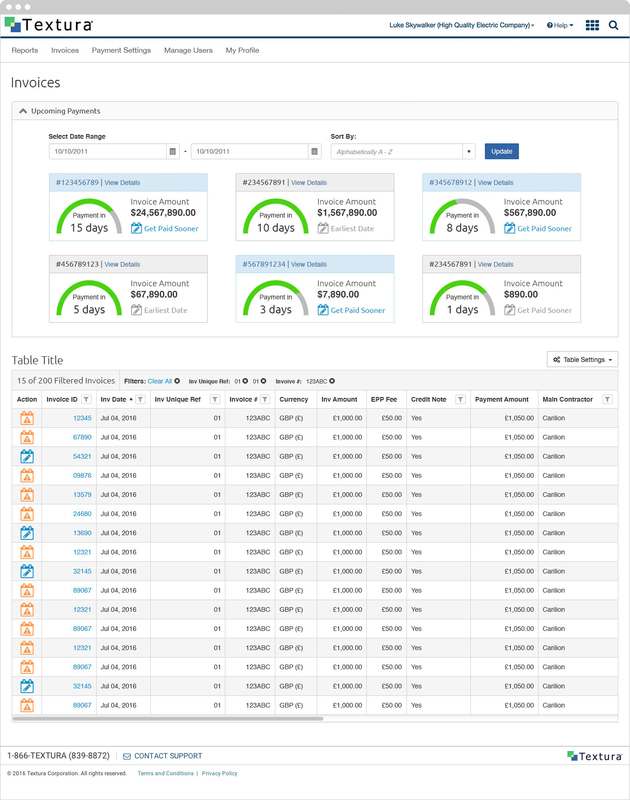 The table displays all the columns by default. The table filters are pre-populated and the user can either search with predictive text or select an item in the dropdown. The filter parameters appear above the table and allow the user to remove filters on the fly. 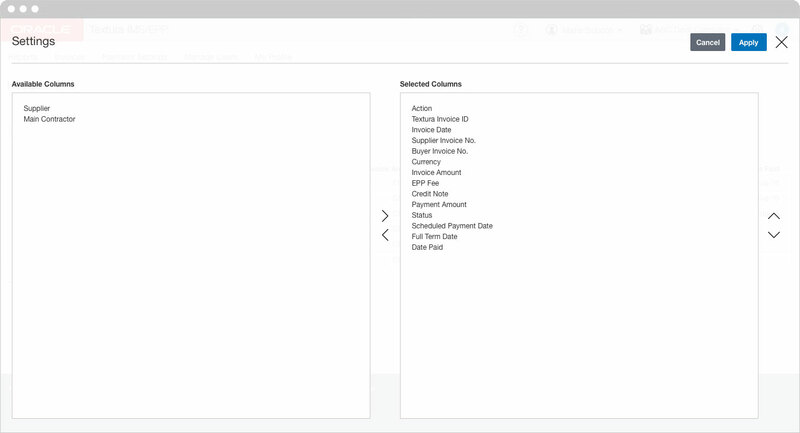 The expandable area above the invoices table shows Upcoming Payments. 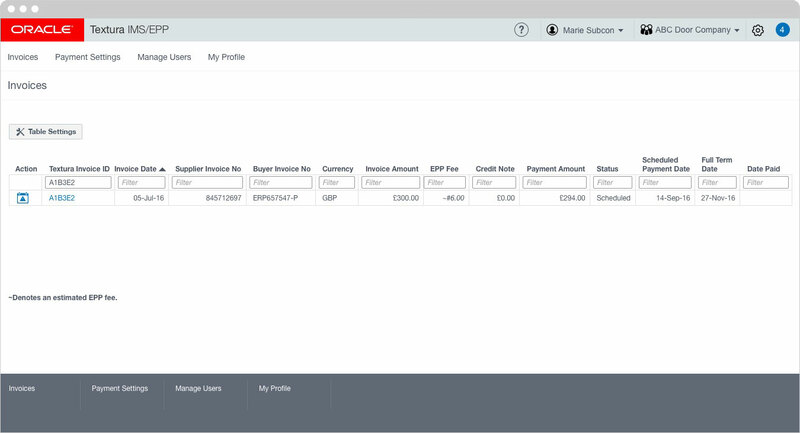 This allows the user to view when they will receive payments. The green/gray half circle represents whether the payment is the earliest option. 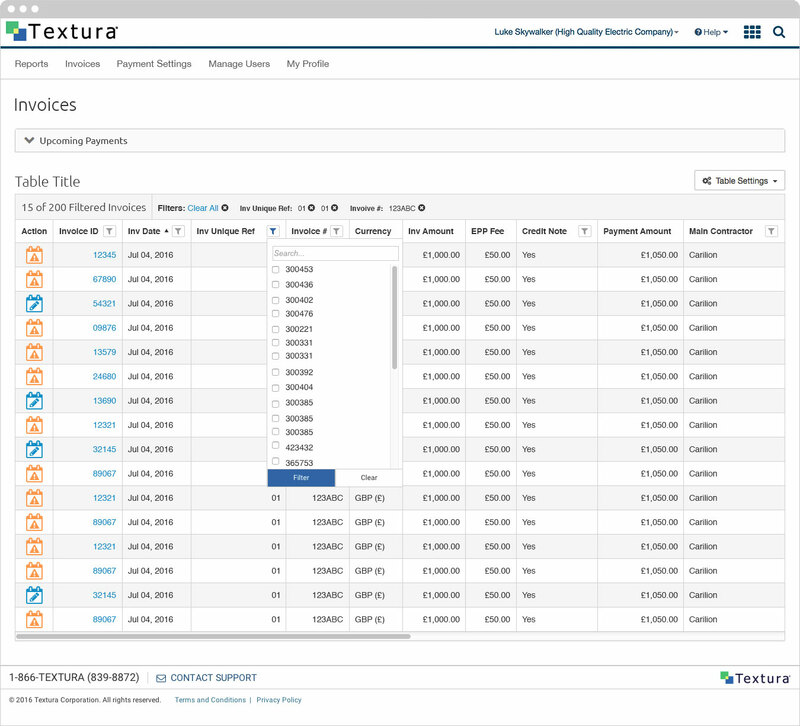 The blue tiles represent payments that can be edited and the gray represents payments that can no longer be changed. I also have Get Paid Sooner highlighted as a way to entice the user to try to get paid earlier, which in turn makes more money. 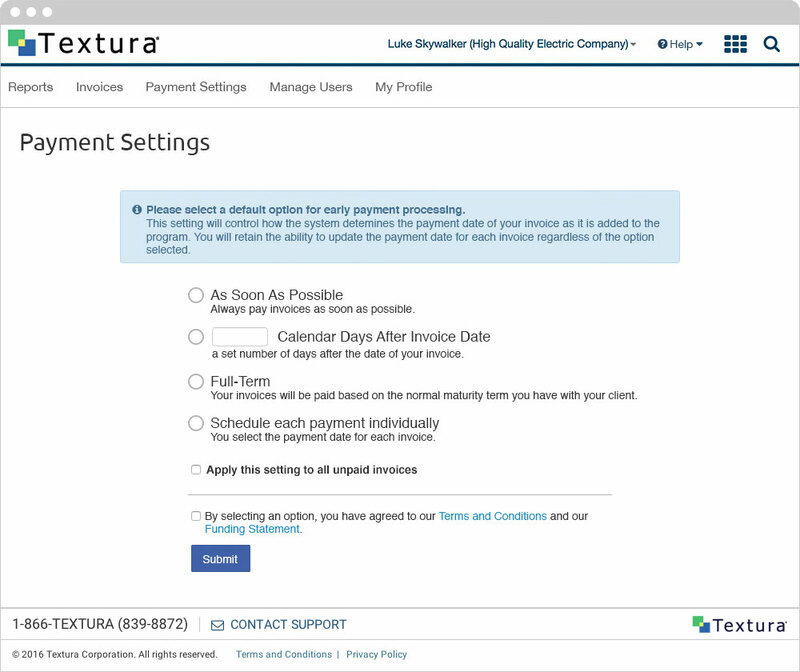 When the user wants to edit or schedule a payment they will see this modal. 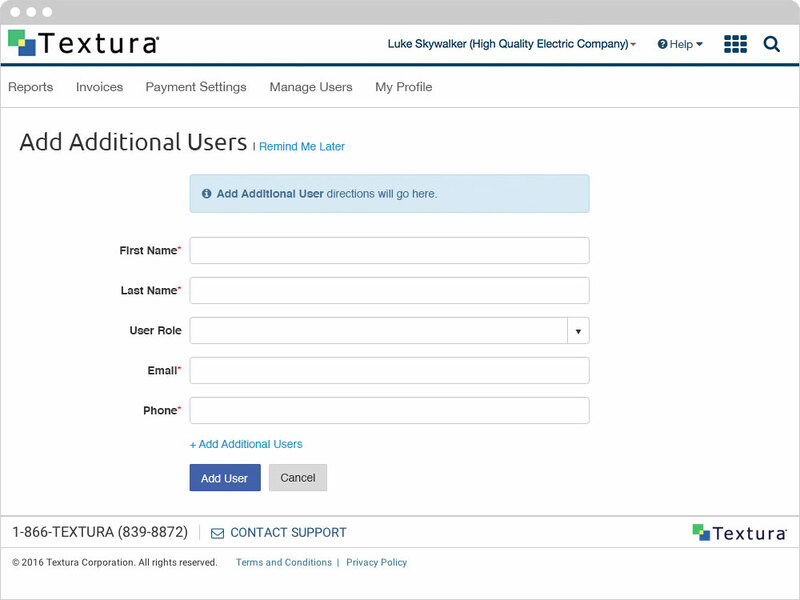 Due to technical requirements the user does not have the same options as the Payment Settings page. 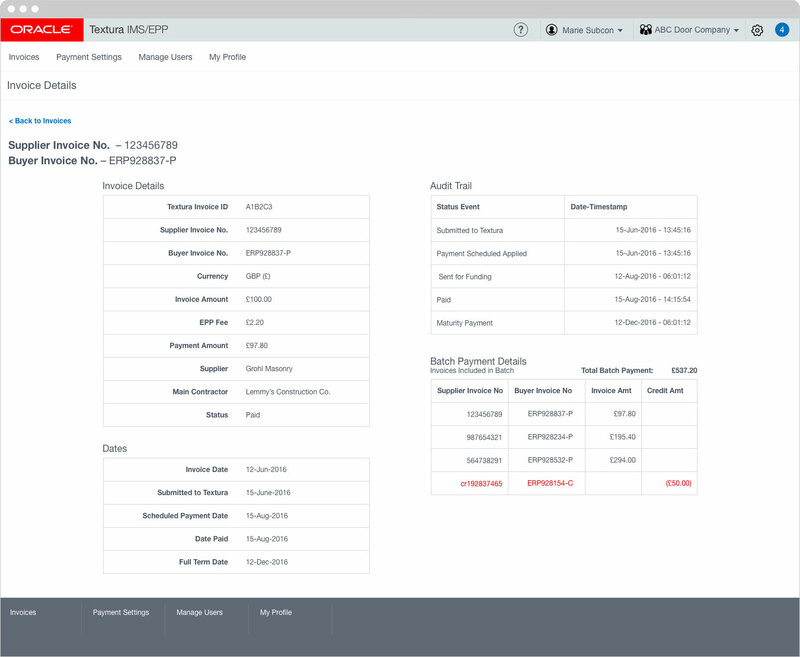 This page displays of all the invoice information, which includes an Audit Trail that shows the timing of all the major invoicing events.